Mosaic in room in west wing, construction from 1st to 4th centuries (Flavian building). The property in which the mosaic is located is part of the Dragonera south site; Dragonera north site. It was a large Antique Period complex which was continuously inhabited from the 1st to the 7th centuries. The complex has been defined as a residential homestead (villa maritima) with an olive processing facility. Dragonera south is the better preserved part of the site, and the floor decoration of the villa from the first building period has been preserved in fragments, but well enough to make assumptions about an expensively equipped building. The mosaic in the room of the west wing of the villa is from the building phase of the 1st to the 4th centuries (Flavian building). The villa was later upgraded and rebuilt, so the floor mosaics from the earliest phase were mostly intersected with partition walls that were built later. The first restoration followed in the 4th century, after a fire, and continuous habitation can be determined up until to the next big fire in the 7th century. A multi-coloured floor mosaic covered the floor of the whole room with dimensions of 7m x 5.3m, and today only fragments have been preserved. The mosaic was made up of two different decorative and compositional segments. It was made of 0.8cm to 0.3cm tessera tiles. The smaller segment of the mosaic is more simply decorated. It was 1.7m wide and 5.3m long and made of a grid of differently shaped rectangular black and white cubes 0.8cm in size. With later rebuilding the mosaic was intersected with walls, so it was spread over three rooms. 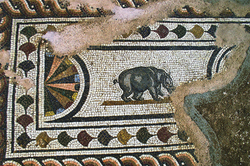 The multi-coloured and larger segment of the mosaic is very complex in composition. According to the fragments, it had a 5.2m x 5.2m square in its centre, and the whole central part of the mosaic was made of differently decorated rectangular and square segments. The whole square was bordered with many decorative bands of different widths, on the outer edge there was a simple decoration of single-coloured black and white bands, after which a black border and a narrow white band with black triangles follows along the whole edge, then again a black-bordered white band follows, after which there is a more complex pattern with an inner edge of wide-band borders. The first wide band is filled with stylized thin tendrils, after which a band with multi-coloured double braid follows. After that series there are compositions of square and rectangular segments richly decorated with different motifs and bordered with simple braid and borders with colourful leaves. Each segment is decorated with rich multi-coloured motifs, according to the fragments these were figurative compositions with geometrical and floral motifs, from which fragments with zoomorphic motifs have been preserved. The best preserved motif is one of a rhinoceros inside one of the rectangular segments (STARAC A. 2010, Dragonera, dva bisera, pp. 32-40). The outer edges are simply stacked monochrome and bichrome bands, while all the other bands of mosaic decoration toward the central part are more complex in composition and motif, and also in colour. The first more complex band, with a motif of various intersecting tendrils, is special because of the interesting heart-shaped flowers inside the tendrils, which are not found in this type of decoration, except for comparable leaves from a spa in Palermo from the 2nd century. The border with double braid is also richer than usual, and is decorated with additional multi-coloured leaf-like shapes in the middle. The central part must have been the most interesting, although only a few fragments have been preserved; a composition made up of rectangles (four) and squares (four) filled with different motifs is clearly visible, and together they border the central square segment. Zoomorphic motifs can be made out, and out of two preserved fragments these are the rhinoceros motif in one half of a rectangle, and an antelope motif in another rectangle. According to this and an adjacent fragment, where rosettes with a lotus flower in the middle of a rectangle have been preserved, it can be inferred that rosettes were placed centrally inside the rectangle, and various zoomorphic motifs were placed around it (they were made out of cubes of smaller dimensions 0.5cm x 0.3cm x 0.3cm). The central square segment has not been preserved, nor has the staggering complexity of motifs in the complete mosaic - it is assumed that it was decorated with a large figurative composition. The antelope motif is not rare for Antique Period mosaic makers, but the rhinoceros motif, in contrast, is very rare. The top of the head is damaged, so the horn is not very visible. Two similar motifs are known about on decorative mosaics, one from the outskirts of Rome (Praeneste) dating from the end of the 2nd century BC, and the other on a black and white mosaic from Perugia from the beginning of the 2nd century. Judging from the depiction of the rhinoceros and the authenticity of the scene at Dragonera, it can be concluded that the artist knew the rhinoceros and that he must have seen it in person. It is not known whether the artist came from or had visited Africa, or whether the animal had been brought to Pula (perhaps for some of the games in the Arena). On the basis of the zoomorphic motifs it has been conjectured that the central motif might have been Orpheus (attracting animals with his playing), and the analogy with the Perugia motif might point that way. The Orpheus and wild animals motif was widespread and popular in the Roman Empire throughout its existence. Other analogies from the era of early Empire are hard to find, back then mosaics were mostly black and white designs of geometrical motifs (STARAC A. 2010, Dragonera, dva bisera). During the clearing of vegetation for the purposes of construction of a tourist complex, the archaeological remains of an Antique Period site were found. Villa Maritima, which was a property of the duumviri quinquennales of the Pula colony, occupied the whole bay. The villa also included a homestead complex, a mooring and a production unit, and the construction is dated to the period between the years of 70 and 90 of the 1st century. There are also the writings of Cassiodorus dating from 537-538 with a description of the properties including the one in Dragonera. The cultural context is the Early Imperial Period and the way of constructing and decorating luxury properties. The descriptions of Cassiodorus help with definitions. In his writings about rural complexes by the sea, like Dragonera, Cassiodorus specifies a series of data, for example he calls them praetoria, in which high officials live, and such properties were independent and closed units. The borders are arranged in more simple ways, and the more decorative parts are arranged differently, depending on motif. Tessera tiles vary in size from 0.8 cm to 0.3 cm. The mosaic has been primarily conserved and bound, and lastly covered in geotextiles and sand. The mosaic has been washed and its edges bound with cement mortar.